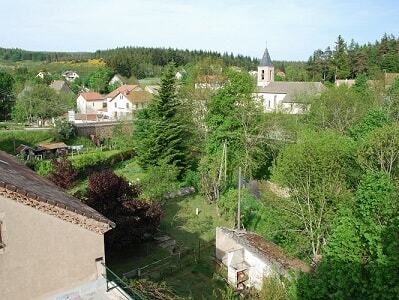 The village of La Bastide-Puylaurent is located on the riverbanks of the Allier in Lozere (Occitanie). Hikes: GR70 Stevenson trail, GR7, GR72, GR470 Gorges of the Allier, GR700 Regordane Way or St Gilles trail, GRP Le Cevenol, Tour of Ardechoise Mountains, Gevaudan and Margeride. Until 1917 La Bastide-Puylaurent was named Puylaurent. The village was founded in the 19th century after the opening of the railway between Nîmes and Saint-Germain-des-Fosses. In the XVIIIth century, La Bastide Puylaurent was only a hamlet composed of several houses along the Regordane Way. We could find there several inns, a way station strongly active in the XVIIth and XVIIIth centuries, within whitch travellers and pilgrims found trouvaient shelter, and at the time of great snowfalls, they could get stuck inside for several weeks. It is only in 1741 that was built the first church located where, one century later was built a modern building. Hiking region of excellence, La Bastide-Puylaurent is at the crossing of the GR7, GR70 Stevenson trail, GR72, GR700 Regordane Way (St Gilles trail), the trail of the Gorges of the Allier, of the of the Mountains of Ardeche, of the Cevenol and of la Margeride . You will find many Hiking loops from 3 to 26km around La Bastide. There are in the village several business: a newspaper shop, a hardware shop, clothes and other vêtements et diverse products, a pharmacy, a butcher shop, a grocery store, a post office, a garage with a fuel station, a railway station (called Gare de La Bastide Saint Laurent les Bains), the hotel la Grande Halte, Les Genets Inn and L'Etoile Guest House. The Camping de l’Allier is located on the road towards Chasserades at 3km of La Bastide Puylaurent on the riverbanks of the Allier. An artificial lake to swim as well as a nice lawn to relax, with game installations for the children and a snack-bar. The village being well served by the S.N.C.F. (the french rail nework), there are no entrance difficulties in winter. For the summer holidays, but as well as for all the year, a lot of guesthouse are open at your convenience. La Bastide-Puylaurent, near the springs of the Allier and of the Chassezac (Moure de la Gardille), is a village founded in the past century on the borders of Lozere and Ardeche thanks to the railway. Less then a hundred years ago, the railroaders replaced the mule-drivers of la Regordane, the forest has taken over the abandonned fields que la forêt a occupé les pelouses deserted by the transhumant herds, and the Trappist monks of Notre Dame des Neiges have renewed the monastic tradition of Mercoire and les Chambons. 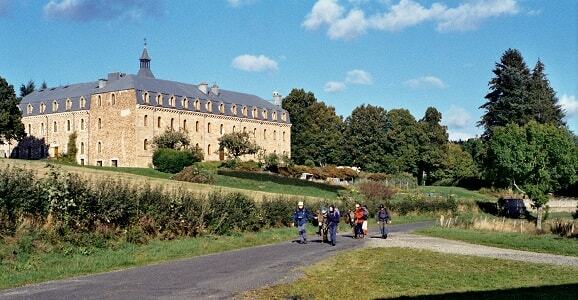 Located at 3km from La Bastide , "la Trappe de Notre Dame des Neiges", a cisterian monastery, founded in 1852. The buildings of today were built in 1918. The Father de Foucauld came in this place to find solitude and meditation. View of the mountains of Ardeche and the mountain of Tanargue (watershed line). To reach the abbey on foot, you can follow the GR72 & GR7. A 14km loop hike following partly the historical trail of Robert Louis Stevenson, goes by the monastery then via the valley of Serres and Rogleton, comes back to La Bastide following the Allier and the GR70 (at this point, also the GR700 Regordane Way). At 2km from the village, the fishing lake of le Beal is an ideal spot to picnic. At 8 km, the spa resort of St-Laurent-Les-Bains, which's waters are used for rheumatisms. At 15km, the medieval village of La Garde-Guerin on the Regordane Way overlooks the gorges of the Chassezac. 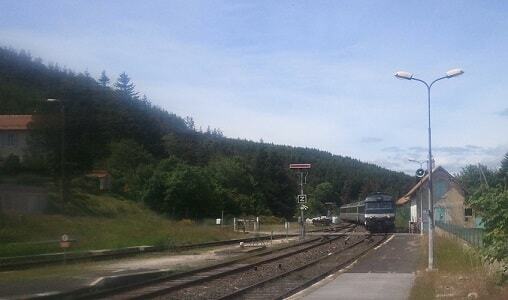 At 28km, the fortified town of Pradelles and its little streets are charged with french history. View on the lake of Naussac. Coat of arms of the village fr:La Bastide-Puylaurent (Lozere) designed by Sanguinez for the coat of arms project of the french Wikipedia, using Inkscape. Source : "creation depuis blasonnement" - Emblasonned : On the left side colored in azure with an golden oak tree with its acorns with three roots and four branches; and on the right side, left white, two skis placed side by side and facing each other. Old romantic Hotel, L'Etoile Guest-House is a mountain retreat in the South of France. With a beautiful park along the Allier River, L'Etoile Guesthouse is located in La Bastide-Puylaurent between Lozere, Ardeche and Cevennes. Hiking trails: GR70 Stevenson trail, GR700 Regordane way (St Gilles trail), GR7, GR72, GR470 Allier river trail. Hiking loops: Cevenol, Ardechoise, Margeride, Gevaudan. The right place to relax.